Jonathan Freedman arrives late, in more ways than one, to an appreciation of Paul de Man. I would suggest that the return to de Mania is significant because it marks the end of something important that transcended de Man, indeed that transcended theory: something I would grandiosely call the end of critical reading. One of the things that is missed in the stories that we tell about de Man, both positive and negative, is the way that he served, along many of his émigré peers and his friends and companions a generation younger than they, as the conduit for a whole wave of European thought into the United States at the moment when the American academy had not yet discovered it. De Man and Deconstruction are out of date. Nevertheless, Evelyn Barish's The Double Life of Paul De Man struck a nerve because Deconstruction asked interesting questions. Unlike the people at the Stanford Literary Lab. A skeptical, de Manian observer might note that limitations of the post-interpretive “big data” dispensation can be glimpsed in the insipidity of the projects it proposes. To say that Austen and Scott were crucial to their successors is to say very little that other critics, speaking on the basis of reading maybe a couple dozen long books, didn’t otherwise say; to say that constructing a database of Whitman is a powerful critical act ignores the way that Whitman’s work itself offered, in its catalogs and its interrogation of them, a celebration and a critique of databases avant la lettre; and don’t get me started on loudness in the novel. Stuart Hall, the godfather of multi-culturalism and coiner of the term "Thatcherism," has died at age 82. If you were a graduate student in cultural studies in the 1990s, he was everywhere. He was the first name on a series of collectively written or edited studies about literary and media culture. Hall was a sort of Che Guevara of the British university system, producing committed leftist work (he was the founding editor of the New Left Review) in sober prose. Hall and his collaborators seemed more serious, more materialist than the French theorists who dominated American cultural studies at the time. In some ways, though, even though they wrote in English, their sociohistorical focus was set so narrowly on Britain that they didn't always translate well across the Atlantic. Hall was known for his writings on race, but in the U.S. he had a lot of competition. Hall's observations of the British class system provided fresher insights, but again they didn't always fit an American context so well. Nevertheless, there was never any question about Hall's authority on any topic he wrote on. And I heard several people say they wished more academics in the U.S. picked up on his work and adapted it to an American context. Too many people tried to be the American Jacques Derrida, and not enough tried to be the American Stuart Hall. By all accounts he was a generous teacher, a warm, supportive colleague, and a profound influence on a generation of scholars and critics in cultural studies. John Dugdale traces the history of the campus novel, which is pretty short. It had a brief flowering in the US, then again in England as US-styled colleges became popular. Now he says the campus novel is dead, even though writers are still trying to mine their immediate surroundings for the stuff of fiction. The cut-off communities that writers love to observe are hard to find in the interconnected contemporary world, and they're otherwise usually forced to visit the past (the Tudor court, the monastery, the long-ago country house) to satisfy such cravings. Also not to be overlooked is their collective reluctance to leave any experience not translated into fiction, whether it's the almost universal experience of being a student or the now widely shared one of teaching literature or creative writing. Looking over the most recent set of campus novels, Dugdake suggests the genre has simply exhausted itself. I wonder if the decline of the campus novel is a symptom not of bad writing so much as a decline of a whole experience of the humanities on campus. The intellectual foppishness lampooned in so many campus novels has died out, killed off by the relentless spread of empiricism in much the same way as eighteenth-century philosophical eccentricity was pushed out by nineteenth-century Utilitarianism. There's no way we could laugh at Timofey Pavlovich Pnin today. As we've learned from Charles Ferguson's Inside Job, Harvard and Columbia professors gave scholarly cover to corporate financial practices that nearly ruined the American economy. Universities, both public and private, serve the common good, yet too often corporate and other special interests drive academic research. In a way this is an ironic consequence of the push to make universities more like corporations. Universities will act like corporations: enjoying the protection of the public trust yet secretive in their pursuit of profit. Already universities resemble corporations in one respect: most of the riches go to a few--in the case of universities, business, engineering, and physical science professors--while the majority toil for scandalously low wages. What if professors could also boost their credentials and keep their jobs by disseminating their research in magazines, newspapers, websites, online journals, books, films, exhibitions and other outlets seen by millions? This would not mean diluting the findings of their work, merely presenting their ideas in a way that could inform, inspire, infuriate or involve the public-at-large. Editors and producers at various news organizations could help them adapt their material for a wider audience. Think what practical or important things we could learn by regularly hearing from epidemiologists, criminologists, sociologists, pop culture experts, management authorities, women’s studies scholars, even economists and business professors not in the pocket of corporate powers. Walljasper argues for a dual publication system: the peer-reviewed journal system, which is critical for quality research, and a public sphere system, in which serious university research helps ameliorate the decline of serious journalism. There are difficulties to overcome. For one thing, it means double the work for professors already groaning under the weight of ungraded papers. There are no structural obstacles to scholarly work being adapted for public consumption. The key is valuing work published on the Internet. It's the end of a crazy busy week. Not much blogging lately--or reading. Nevertheless, with autumnal weather settling in, I start to consider picking longer, more challenging books to read. Here are four new releases (except for the Giedion book) from authors I've read and enjoyed before. Fredric Jameson, The Hegel Variations: On the Phenomenology of the Spirit : Jameson has long been a major influence on me. Like Walter Benjamin, Jameson writes confidently on a broad range of cultural texts. From time to time somebody urges me to focus this blog on one topic, and I respond by pointing to Benjamin and Jameson. I'm still waiting for Jameson to produce a follow up to his magisterial Postmodernism, or, The Cultural Logic of Late Capitalism , but lately Jameson seems to have retreated into philosophy. Reading Hegel is rough going, but he's extremely important. It's not possible to discuss the concept of freedom, for instance, without taking into consideration Hegel's dialectic of self and other. One can't think about one's freedom until he or she acknowledges their dependence on another. Jameson will explain all of this and more. Alain Badiou, The Communist Hypothesis . My wife is worried about the Daniel Biss sign in our front yard even though Obama carried our home town in 2008, so it's hard to imagine taking a seat on a commuter train and opening up a book called The Communist Hypothesis, with its Leninist red cover. However, Marxism has made a bit of a comeback among economists since the collapse of the world economy in 2008, primarily because Marxism has an explanatory power and long-term perspective that its rival economic theories can’t touch. This book was inspired by Badiou's despair over Nicolas Sarkozy's victory in the 2007 presidential elections, but shares American economists' interest in Marxism as a method of critique. He argues that without Marxism the world would be stuck in an endless repetition of all the problems of capitalism. Badiou's dense and irascible style takes some getting used to, but he never ceases to be provocative. Sigfried Giedion, Space, Time and Architecture: The Growth of a New Tradition . Giedion was Walter Benjamin's favorite architectural historian, and Giedion is extensively quoted in the Arcades Project. For example, Giedion taught Benjamin to see the world exhibitions as Gesamtkunstwerke, or total works of art. In Space, Time and Architecture Giedion traces the history of the organization of space, beginning with the Renaissance and continuing up through Modernism. Noel Carroll, Art in Three Dimensions. Philosophers have always been more successful when studying literature than film. I've always been ambivalent about Carroll's work. I didn't care for Mystifying Movies: Fads and Fallacies in Contemporary Film Theory (1991), but later in the Nineties he proved to be a keen thinker about the cinema. Carroll has always been suspicious of aesthetic theories presupposing the autonomy of art, and in this book Carroll urges philosophers to look at how people interact with art under specific cultural circumstances. Since 1947 Roosevelt University has been housed in Louis Sullivan and Dankmar Adler’s Auditorium Building, located in Chicago's South Loop. This summer the university has initiated construction of a 32-story academic and residential tower will rise to the north of the Auditorium Building. The new tower is designed by VOA Associates of Chicago and is inspired by sculptor Constantin Brancusi’s “Endless Column," with the blue and green glass skin becoming gradually lighter as it rises. It's scheduled for completion in 2012, which is enough time for someone to buy the naming rights to the building, currently referred to as "the Wabash tower." The building represents a departure from the traditional American university campus form of Gothic, medieval, Georgean and Beaux-Arts buildings placed in a village setting, reflecting the romantic ideal of education isolated in nature. From time to time universities have acknowledged their urban settings, of course. In 1867 Johns Hopkins University, for instance, was laid out in the same grid pattern as the rest of Baltimore's city streets. But the average American college campus likes to pretend it's really an English medieval college at the end of a freeway offramp designed by Erasmus. Post-World War II universities have embraced the complexities of their settings, as well as of their educational missions. As enrollments and endowments increased, universities built out-of-scale dormitories, student unions, and laboratories--not to mention football and basketball stadiums. Still, these new structures, often designed by distinguished architects, merely filled in the spaces of traditional campuses and rarely challenged the notion that higher education was somehow separate from other spheres of activity. The old ideal of the privileged gem set in green space remains at even the most adventurous campuses. The Roosevelt University not only has no green space (unless one counts Grant Park, across Michigan Avenue), it is barely distinguishable from its corporate surroundings. Its new tower is being constructed near the red CNA building, where my grandfather once worked. Roosevelt's tower retains only two design features that mark it as an educational institution: its highly textured skin and elaborate shape reflect the complexity of modern educational endeavors, and its "Endless Column" form is a metaphor for the ideal that the educational process is never truly complete, much like the process of paying back student loans. One old distinction remains, however: the new tower will house the school of business, a "high-tech" discipline (or "high-revenue," which amounts to the same thing), while the fusty, low-revenue humanities will remain in the Auditorium Building. Mark Athitakis at American Fiction Notes passes on the reading list for James Mulholland's “Literature and Culture After 9/11” class at Wheaton College in Norton, Massachusetts. Also part of the class were Bruce Springsteen’s The Rising and John Adams‘ spooky On the Transmigration of Souls. This is quite a reading list. DeLillo's novel was a disappointment, but the O'Neill novel I liked a lot. Now my wife and President Obama are reading it. The only other major novel I can think of that could be on this list if Claire Messud's The Emperor's Children, which, I'm guessing, Mulholland dropped in favor of Netherland, which was the superior novel. Deborah Eisenberg's Twilight of the Superheroes is an excellent Zeitgeist collection, but the connection to 9/11 is too oblique. If there's been a great 9/11 novel, or any other great 9/11-related work of art, I haven't heard about it. Are we still waiting for it? Another issue is the lasting cultural impact of 9/11. Which event will prove to have caused the most profound cultural change: 9/11 or the Great Recession of 2009? My guess is the latter. 9/11 was a profound national trauma, but it didn't change any cultural institutions or artistic practices. The terrorist attacks made architects wary of building skyscrapers, but the recession has dealt the body blow to the entire profession. Newspapers struggled to cover the attacks, but now newspapers are struggling for their lives. In publishing and the cinema the story is the same: 9/11 changed the content, but the recession may change the form. A couple of days ago--I'm just catching up now after dealing with a work crisis and general exhaustion--Stanley Fish blogged about the politics of French theory, or more specifically, the American politicization of Jacques Derrida. In his weekly post Fish recalls the culture wars of 1980s and '90s academia, when deconstruction and various other imported theories were at their peak of prestige and influence--as well as the peak of the furious counter-reformation of conservatives such as Allan Bloom, Dinesh D'Souza, and Roger Kimball. I was a graduate student in literary and film studies during the peak of the culture wars. Reading Derrida and the French theorists was exciting, but our understanding of them was piecemeal. With sixty freshman comp essays to grade and two seminar papers due, who had the time or the energy to puzzle through the entirety of Writing and Difference or Ecrits? All we were looking for was some terms to describe what we saw all around us. Deconstruction was irritatingly resistant to systemization or coherent summarization, but in its playful logic, at once anarchic and rational, seemed to be an antidote to the times. This was, after all, the post Reagan-Bush era, when the political fault lines we're now struggling to overcome were first being drawn. The conservative revolution, with its evil blend of economic ruthlessness and religious cant, fit neatly into Derrida's deconstruction of essence and margin. Derrida gave us a decorous way to say our country was run by a band of greedy, callous assholes. Republicans may have had tax breaks and Fox News on their side, but we had language itself on ours. Foucault had taught us that language was out in front of action, so history, we hoped, was on our side. The problem, of course, was that one can't know ahead of time which language practice was in the lead, and which was trailing dreamily behind. Remember when it was cool to think that rap gave voice to the voiceless? Stanley Fish, with Miltonian scorn, says that seminar room guerillas like me were deluded from the start. He cites Francois Cusset, author of the forthcoming French Theory: How Foucault, Derrida, Deleuze, & Co. Transformed the Intellectual Life of the United States (University of Minnesota Press) to claim that Derrida was innocently deconstructing Rousseau when he was seized by impatient and vengeful American academics for their "bellicose drama" (Cusset's phrase). Fish shakes his head at American academic liberals on the hunt for pernicious logocentrisms and the even more vituperative conservatives who loved to hate them. "A bunch of people threatening all kinds of subversion by means that couldn't possibly produce it, and a bunch on the other side taking them at their word and waging cultural war," Fish writes. "Not comedy, not tragedy, more like farce, but farce with consequences." I don't suppose it matters much to point out that beginning with The Post Card Derrida himself took a decisive turn toward the political. "I have often had to insist on the fact that deconstruction is not a discursive or theoretical matter," he declares in that book, "but practico-political, and that it is always produced within what we call (rather summarily) institutional frameworks." Nor would it do much good to remind the famously stubborn Fish that he came to prominence during the era of high theory by creating a role for himself as deconstruction's dangerous supplement. But it is worth noting that the twilight of the conservative revolution, we're arguing again about centers and margins, reality and representations, ideology and praxis--all the topics we kicked around the seminar room in the 1990s. Every so often I check in on my old life, and every time I do, it seems like not much has changed since I left university teaching in 1999. It's reassuring to know that I haven't missed out on some terrific new developments, but also it's troubling. Yale English professor William Deresiewicz reads the twentieth anniversary edition of Gerald Graft's famous Professing Literature and considers the current state of literary studies. It doesn't look good. The job market is pretty much the same as it was when I was looking for a teaching post, except there seems to be more film studies jobs. Post-colonial literature is still popular; I would have thought that theoretical zeal would have cooled in that area by now. Also still popular are the overstuffed backpack jobs. Exaggerating only a little, Deresiewicz gives some mock examples: "Asian American literature, cultural theory, or visual/performance studies"; "literature of the immigrant experience, environmental writing/ecocriticism, literature and technology, and material culture"; "visual culture; cultural studies and theory; writing and writing across the curriculum; ethnicity, gender and sexuality studies." I remember laughing with my fellow grad students over an MLA job listing looking for a post-modern medievalist. It was the only time we laughed during job search season. It's the fact that no major theoretical school has emerged in the eighteen years since Judith Butler's Gender Trouble revolutionized gender studies. As Harvard professor Louis Menand said three years ago, our graduate students are writing the same dissertations, with the same tools, as they were in 1990. Nor has any major new star--a Butler, an Edward Said, a Harold Bloom--emerged since then to provide intellectual leadership, or even a sense of intellectual adventure. The job market's long-term depression has deepened the mood. Most professors I know discourage even their best students from going to graduate school; one actually refuses to talk to them about it. This is a profession that is losing its will to live. It seems that literary studies' great experiment in combining esoteric theory with rabble-rousing populism is now over and nothing else has taken its place. What would seem to be an obvious solution--simply returning to close readings of great works of literature--isn't possible any more for a variety of complicated reasons, most of them to do with the current state of university education in the United States. It's sad that the intellectual adventure really does seem to be over. That was one of the reasons why I left: I seemed to be stuck in place, and so did the whole profession. This isn't my fight any more, but I hope the profession solves its considerable intellectual and institutional problems. One final note: I've wondered aloud if the architecture profession is now in the same condition literary studies was twenty years ago: dominated by stars, but having trouble translating cutting edge work into a popularly accessible medium. It seems like every week a startling new museum or skyscraper goes up, but private houses and small business facilities look pretty much the same way they did two decades ago. And once the starchitects start retiring, there's no guarantee that a new set of architects will have the clout to forge ahead with new design ideas. Every designer knows the phenomenon of the three proposals: the first is a radical one that the customer is too square to pick but shows off the designer's creative chops; the second is a watered-down--but more fully realized--version of the first that the customer is supposed to pick; and the third is the tamest, and lamest, design concocted mostly to prove that the customer has no taste whatsoever. Much to the dismay of the designer, as often as not the client usually chooses design number three. Sometimes design two is chosen, but the first design isn't even supposed to be picked because it's sketchy on the details of how the thing will be made. But Michigan State University seems to have picked the first one. Yesterday the university announced that it had chosen Zaha Hadid to design the Eli and Edythe Broad Art Museum on its campus in East Lansing. According to Eli Brand, who donated money for the project, Hadid was chosen because she presented the "most innovative design." This explanation is just for a newspaper, so it doesn't fully reflect the thought process behind choosing Hadid's proposal. Nevertheless, the idea that a design should be chosen primarily because it was the most innovative raises some questions, especially considering the backlash against the starchitect phenomenon. Was her design chosen because it would look striking in a brochure? Was it chosen because it was the architectural equivalent of the cinematic aesthetic of distraction, which tries to hold the attention of a distracted viewer through splashy special-effects and quick editing? Or was there something properly Kantian going on here? Is her proposed building an object that is a sensuous idea, a harmonious object that is nevertheless irreducibly itself? What's clear, however, is that the university was serious about commissioning a distinguished piece of architecture. It couldn't have been easy choosing one proposal from the likes of Hadid, Morphosis, Coop Himmelb(l)au, Kohn Pedersen Fox, and Randall Stout Architects. Hadid is a brilliant architect, to be sure, and she's already produced one intriguing design for a university trying to raise its profile. 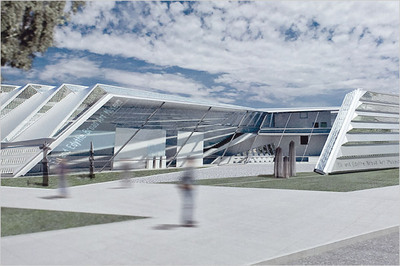 Hadid has always seemed like she was designing the concept for a building, rather than an actual building. This will lead to an embarrassingly bad building one day, but the Broad Art Museum isn't that design. In any case, a highly conceptual architect like Hadid would've appealed to academics, who have a highly developed taste for the abstract. In her New York Times article Robin Pogrebin suggests that the cosmopolitan Zaha Hadid may seem out of place on the campus of a Big 10 university, but her selection makes a certain kind of sense. Having attended a couple of universities that were similar in many ways to Michigan State, I wonder if the university saw itself in Hadid: someone whose ideas are bigger than her accomplishments. Yes, her selection reflects a certain insecurity, but it's the kind of insecurity that leads to innovation.